What’s the number one omnivore’s treat that vegetarians miss eating? Okay, fine, technically it’s bacon (don’t ask me why that is, as I don’t miss it at all), but I’m going to bet that marshmallows come more or less right after it, definitely in the top five. This hole in the vegetarian’s candy jar is hard enough in the summer, surrounded by blissfully happy s’more-toasters at any campfire you twirl a veggie dog over. But months later, Easter hops onto the scene, and suddenly us vegetarians are surrounded by not only chocolate-covered marshmallow eggs, but Peeps, glorious Peeps. A few years ago, I started satisfying s’mores cravings with a complicated procedure involving a low-heat oven, Marshmallow Fluff and a blow torch, but then homemade marshmallows became all the rage. It killed me even more than I not only couldn’t eat regular marshmallows, but I also couldn’t make their gourmet grown-up cousins. I saw a recipe for marshmallows made with agar at one point, but I was never really keen to try it knowing the kind of brittle, flaky gel agar tends to produce. At one point, there was a brand of vegetarian marshmallows on the market, but they were outed as not actually being vegetarian before I got my hands on a bag. Fortunately, the situation is on its way to being resolved. 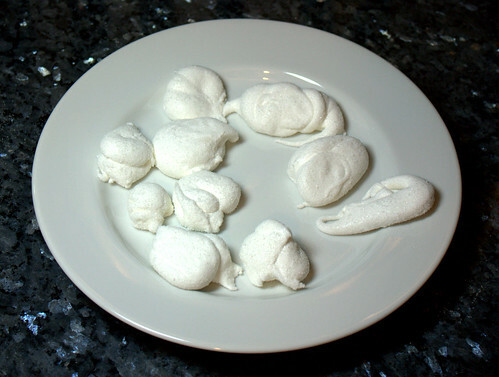 Last year, Chris started getting curious about molecular gastronomy stuff, and one of the interesting recipes he came across was a recipe for marshmallows set with xanthan gum rather than gelatin. It’s from Texture: A hydrocolloid recipe collection, a free PDF download at khymos.org that contains all sorts of interesting recipes, from the weird to the ingenious. He made them, and even though he over-cooked the sugar and made “caramel marshmallows”, I was really amazed at how good the texture and flavor were. We meant to make them again, getting the temperature right this time. Months passed and it didn’t happen, but those Peeps have been taunting me from the shelves at the drugstore, so today I printed off the recipe and decided to give it a go myself. 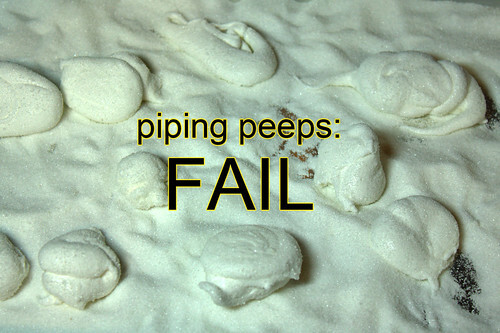 I knew they’d taste good, but could I pipe them into real, actual Peeps? The procedure for making the marshmallows was so quick and easy, I’ve decided that it was easier than going out to buy marshmallows at the store. The recipe has you grind the xanthan gum with one tablespoon of the sugar, but my mortar and pestle smell suspiously of Indian herbs, so I did my best in a regular bowl with the back of a spoon. As far as the cooking goes, you boil water, sugar, corn syrup, cream of tartar and half a vanilla bean to 120°C (soft ball stage). The syrup (without the vanilla bean) gets drizzled into the egg whites while the mixer is running. Next, you sprinkle the xanthan gum/sugar mixture on top of the expanding egg whites. Then you just continue whipping until the marshmallow begins to pull away from the sides, like it has here in this photo. Working quickly, I began preparing to pipe my Peeps. I like to use a tall cup to hold my piping bags while I fill them, and fold back their tops like shirt cuffs to keep them as clean to work with as possible. Even with this help, the marshmallow really didn’t want to let go of the spatula. 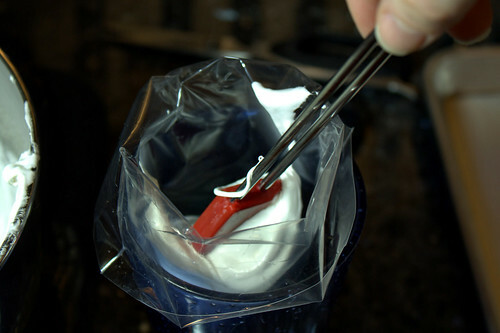 Finally, I got enough marshmallow goo into the piping bag to at least see whether or not it was going to work. And did it work? I could pipe the shapes just fine. The marshmallow wasn’t hard to squeeze or direct. The problem was it just wouldn’t let go of the pastry tip! 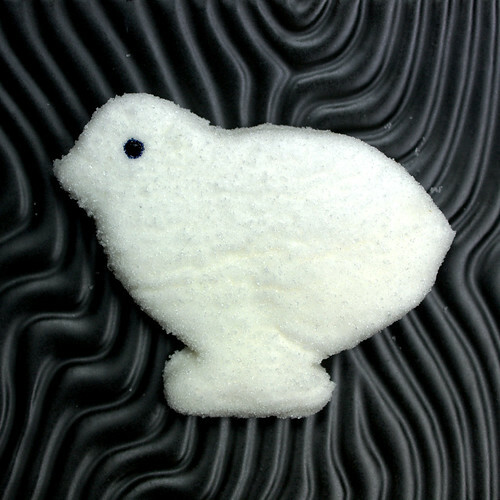 It would stretch forever without letting go, and so in my attempts to shake, pinch or otherwise wrench the bag away from the half-finished Peep, any resemblance to a Peep was entirely lost. I kept trying until the piping bag was empty. Then I moved my deformed Peeps and added more sugar to the little quarter sheet pan (by the way, I was using vanilla sugar from the jar I keep my vanilla beans in, just to add a little more flavor) and dumped the rest of the marshmallow in the bowl onto it. After liberally dusting the top of the marshmallow mound with more sugar, it was surprisingly easy to press it flat in the pan. I was even able to pick it up from underneath and stretch it with my hands. I wrapped the pan tightly with plastic wrap and left it in the fridge for about four hours, then took it out. I still wanted the marshmallows to be Peeps, so instead of cutting them into squares, I got out my favorite little flower cookie cutters and the chick-shaped one I used to make the decorations for my Cadbury Creme Brul’eggs. I found that greasing the cutters with a little oil and dipping them in sugar was enough to keep the marshmallow from sticking to them. To cut out the centers of the flowers, I used the end of a plain round pastry tip. As I cut each shape out, I put it in a container with more vanilla sugar in it, making sure to get the sticky sides coated and giving the whole thing an occasional shake and toss to keep everything covered nicely in sugar. In the end, I have to say that these are definitely Peeps, even if they don’t look quite like the mass produced variety. Why? Because my mouth thinks they’re Peeps. The have the same crunch from the coating of sugar contrasting with the squishy marshmallowiness, except the homemade type aren’t stale. I have to say, I think these xanthan gum marshmallows might even be more marshmallowy than normal marshmallows or Peeps, partially because of the qualities of the gum (it’s used to add a “fatty” feeling in nonfat and lowfat dairy products), and partly because they contain egg whites, whereas most marshmallows are little more than sugar and gelatin. They have a rich, luxurious mouthfeel, and the flavor from the vanilla bean doesn’t hurt, either. However, I still want to be able to pipe out real Peep shapes. After studying the differences between regular marshmallow recipes and ones made specifically for piping, I think I may have figured out the problem with piping the xanthan gum recipe. If my new formula works, you’ll being seeing some 3D Peeps here in the next week. If not, I’ll probably keep that FAIL to myself next time. This entry was posted in Confections, Easter and tagged candy, Easter, marshmallow, Peeps, sugar work on April 2, 2009 by Jessica Petersen. Thanks for the tip! I used to have to make rice krispie treats for the buffet where I worked (to dip in the chocolate fountain), and yeah, oiling down my gloves and bowl scraper was the only way to get a full sheet pan of them muscled into shape. I was hesitant to do that to fresh marshmallows since the rice krispie treats already have butter in them, but I’ll definitely try that next time. I’m so glad you posted this! I’ve always been on the search for a good vegetarian marshmallow recipe. With Easter approaching I was definitely starting to crave some Peeps. Now I can try and make my own! Yay! It’s wonderful to actually be able to eat marshmallows. 🙂 Plus these were pretty fun to make, other than the whole fail part. OMG!!!! Why didn’t you just use ricemellow??? It’s just like melted marshmellow it’s corn free and gluten free. I’m alergic to corn and gluten and I make rice crispie treats with ricemellow all the time and I LOVE them!!!! So much simpler if you know how to make ricecrispie treats then all you have to do is use ricemellow instead and you’ll have an amazing treat!!! Haha, thanks. I have sort of a love/hate relationship with them, depending if I’ve already eaten them or not, so I understand. You are my HERO. I’ve been a vegetarian since I was about 7, so I don’t really “miss” anything – except marshmallows! I lust after them in the store, I crave them when friends are eating s’mores… There’s one company that sells legit, non-gelatin mallows, but they’re expensive and besides, I have also wanted to jump on the “homemade, gourmet marshmallow” bandwagon. And now I finally can! Seriously, my hero. Hehe, I’m so glad I did these then! I’m still amazed that they’re so easy to make. And they aren’t expensive…xanthan gum is fairly easy to come by because it’s used in gluten free baking. Bob’s Red Mill sells bags of it, usually in the baking aisle. I think it’s harder for those of us missing marshmallows rather than bacon because at least bacon seems like it isn’t vegetarian. Marshmallows are just puffy white sugar…they shouldn’t have dead animals in them! Marshmallows sans gelatin? You have my full attention – this is great! I downloaded the hydrocolloid file and am loving it! Have you tried to make the agar marshmallows? How interesting! I’ve always wondered if gelatine-less marshmallows were feasible. The chick-shaped one is very cute. i cannot wait to try these…how are they after a few days? i tend to think they would be best soon after they are set, but what is your experience? thank you for sharing! whats vegetarian about egg whites…ummm i thought those came from an animal? Everyone seems to have a slightly different definition of what it means to be a vegetarian, but for us this boils down to “comes from” vs. “made out of”. As long as you’re not talking about fertilized eggs (which usually cost extra and are not usually available at normal grocery stores), they are generally considered to be vegetarian (lacto-ovo vegetarians being the most common type I’ve run into), but not vegan (which would mean no animal products whatsoever — sometimes extending beyond diet to products like wool). 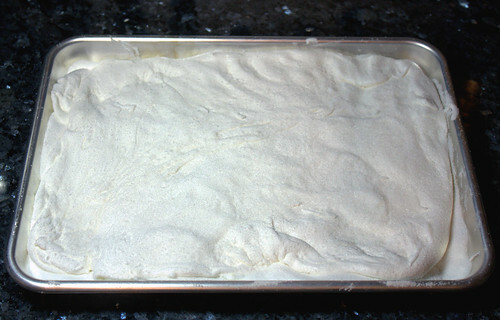 It’s difficult to do any truly vegan pastry work because even things like granulated white sugar are not usually vegan (based on manufacturing techniques). Both Jessica and I have run into the occasional vegan marshmallow recipes (usually made from whipped sugar syrup), but have not tried any of them yet (so far it’s just been a pleasure to find one that works without gelatin). As a vegan I’d LOVE to know a great vegan peep recipe. I’ve found one recipe, but it was REALLY involved. I would love to have an easy/quick recipe. I love Peeps, even the stale ones. I’m vegetarian but still make and eat regular homemade marshmallows (my vegetarianism is mostly due to health reasons and just not liking meat). I might try these just because they sound good, though. wow! these actually worked…despite my junky scale and somewhat haphazard measurements. I also used powdered egg whites reconstituted with water instead of fresh egg whites. Awesome!!! Awesome! They look good! I’ll be linking to you! Ok, I posted two comments above as “jenn” without realizing that someone else had posted as “jenn” as well. in order to distinguish myself, i have added a ‘k’ to my name. anyway, i still think these are amazing, but i am curious how you store them? i stored some in the refrigerator and some in an airtight container at room temp. The room temperature ones actually melted quite a bit, so I think refrigerator is the way to go. Thank you…I am going to dip some in chocolate to make chocolate eggs too. I just came over from CroqZine to check this out. I’m SO excited to try this! And this? Made me laugh SO hard! I thought you make like to try to make this fantastic homemade vegan marshmallow recipe. It uses agar agar and soy protein isolate which most commercial brands use too. 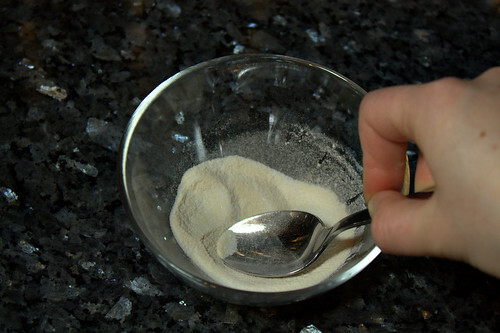 The soy protein isolate makes a fluffy mix into which the jell mixture is beaten. Jenn–on the page linked, the author (you?) recommends topping one recipe with jelly crystals–sweetened gelatin powder–defeating the entire purpose of making veg*n marshmallows. As an ovo-lacto vegetarian, Tiger’s version looks far more enticing–fluffier, creamier, and more long-lasting than any vegan mallows I’ve seen. I’ve downloaded the hydrocolloid recipe collection, and it also includes a vegan marshmallow recipe which uses methyl cellulose as a thickener, although it must be served hot as methyl cellulose paradoxically melts when cool. Thanks for the recipe link and for sharing your adventure, Tiger! I think you are thinking of vegans. Generally, “vegetarians” refers to lacto-ovo vegetarians, who eat animal products like eggs, dairy and honey. Sadly, this recipe is not vegan, but it is vegetarian. Couldn’t you line your mortar and pestle each with plastic wrap? The sugar crystals are pretty sharp. I think they might grind through the plastic wrap…but I’ve never tried it, so who knows! It might work pretty well. Nice recipe. I’m veggie and miss marshmallows (especially in hot-chocolate and in cookies), so I’ll try and source some of the geletin replacements. It never seems that easy in the UK for some reason. I wondered if you’ve tried colouring them? I fancy trying to do some more decorative ones – maybe pink and white. I wasn’t sure if adding food colouring drops would be a problem? .-= Frances´s last blog ..Slow Club/The Cheek/Cate Le Bon =-. For hot chocolate, you can always make marshmallow fluff and just dollop it on top. I’m not sure if you can buy the actual commercial Marshmallow Fluff in the UK, but we realized at some point that it didn’t have gelatin in it, and bought a case to make s’mores with! 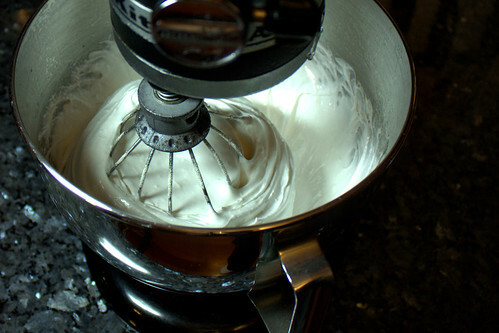 You could make it pretty easily, though…I think it’s pretty much just a Swiss meringue. I have a good recipe for that somewhere on my blog. I haven’t tried coloring them yet, other than painting eyes on the chicks. It probably would work just fine. I’m a wee bit afraid of doing it myself, due to a disastrous attempt at coloring meringue for a cake years ago, but I was using an all natural food coloring and that was the reason it went so badly. Regular food coloring should be fine. Thank Goodness… I found a gelatin-free marshmallow recipe!!! I can hardly believe this! I thought I would never be able to have marshmallows in this life! Can you email me the recipe, with exact measurements? thanks. I tried a mixture of a couple of recipes and it basically worked. i have the recipe is anyone wants but what i basicly did was to use a normal marshmallow recipe but substitute the gelatine for vegetarian jelly powder bought from holland and barrets. i used half a pack, dissolved in a tablespoon of boiling water, and they turned out a bit mushy but they did keep some shape. if i was to do it again i would add the entire packet of gelatine so they were more firm. Cheri, Sweet and Sara makes veggie marshmallows and Dandies does too! Did you ever try this again? They look delicious. I am trying this for marshmallows, not peeps, hopefully within the week. I don’t trust agar, I never find success stories. I will post how they turn out, everyone generally wants to hear (I hope so, $15 for xanthan is steep for me). Call me blind but i can’t seem to find the recipe to these marshmallows. i was wondering if you could directly send me the recipe or tell me where on the khymos.org site i can find the recipe. sorry! thanks! It seems like perhaps snipping the marshmallow with sugar-coated or cooking-spray-coated scissors would allow it to come undone and look less like, um, peep poop. But I really really like your little shapes! 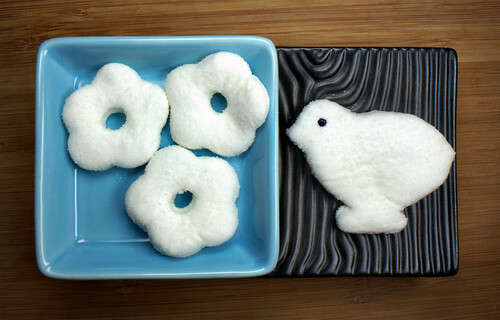 I’m tempted to try it with lightly colored sugars. This sounds great! I am excited although the link seems to be broken or there’s something wrong with that website. Could you send me the recipe please? P.S. agar is wonderful! I made vegan jello for halloween. The whole tray was nearly gone in 10 minutes. Wow – that recipe makes a huge bowl of marshmallow creme. I am having trouble with the consistency and it may be due to the fact that I used reduced calorie corn syrup. I also skipped the cornstarch and instead used the oil and sugar method, but find that it’s next to impossible to cut the marshmallows into squares and retain their shape. However, the creme was so tasty that I’ll make them again and will play with flavors and investing in a large supply of Rice Krispies! These took quite a lot of effort (and mess…) to make, but I figured that it would be worth it if i could finally have marshmallows after 7 years of vegetarianism! I was upset initially, because instead of cute shapes, mine were more like amorphous blobs that squashed down into puddles if left alone long enough. I fixed this by coating them in sugar and storing them in mini-muffin trays to make marshmallow-ey shapes. What made everything worth it though, was finding out that these actually toast over the campfire like normal ‘shmallows! They’re a bit more tricky to roast (to avoid them blobbing into the fire), but if done right they get all light brown and bubbly! Absolutely delicious… I was so happy to have roasted marshmallow again!! Thanks! Yeah, you need the real corn syrup because you need the chemical properties of the sugars in it to make the marshmallows set. Having made them a second time, cornstarch does seem to be the way to go. What made everything worth it though, was finding out that these actually toast over the campfire like normal ’shmallows! They’re a bit more tricky to roast (to avoid them blobbing into the fire), but if done right they get all light brown and bubbly! Absolutely delicious… I was so happy to have roasted marshmallow again!! Thanks! Since when are egg whites vegetarian fare? Most people mean “lacto ovo vegetarian” when they say “vegetarian”, meaning “eggs and milk are OK”. It’s “vegan” that always means “no animal products whatsoever”. How many times do you/we need to explain this? Are people still confused by this? ?